The death of King Charles II, on 6th February 1685, was a blessed release for a man who went through all sorts of tortures at the hands of what passed for the medical profession at the time. Charles had been a popular king, especially after the Puritan years of the Cromwell regime when just about every public activity that gave people pleasure was banned. When Charles returned from exile in 1660 the theatres re-opened, music was allowed in public places, and people once again appreciated that life could be enjoyed as well as endured. Charles was a fit and active man who participated in many sports including hunting, tennis, sailing and rowing. He took a daily walk, often quite a long one, and continued the practice until the day he fell ill, despite suffering from gout and a running sore on his leg. However, he seemed to get plenty of private exercise as well, being credited with at least fourteen bastards by several mistresses, these including the delightful Nell Gwyn. Despite this track record he was never able to father a legitimate heir although, as Samuel Pepys noted, he never spent a night away from the Queen. She must have been relieved that Charles did not have the same attitude as Henry VIII when it came to queens who could not produce heirs. Charles, who was aged 54, first felt unwell on Sunday 1st February and the following day he collapsed with symptoms that suggest a stroke, such as slurred speech, but accompanied by convulsions and fever. He was then assailed by a phalanx of doctors, each of whom believed that they had the answer and was given the opportunity to show that they did not. Over a period of four days Charles was subjected to 58 different treatments administered by 14 doctors. As well as bleeding, including from the jugular vein, he was given purgatives, emetics and enemas, had his head and feet branded with hot irons, and made to drink a spirit distilled from the bones of someone who had died a violent death. If these treatments were applied to someone today it might be thought that they were being tortured rather than being given medical care! It appears that nobody suggested “bed rest” as an appropriate treatment for a sick man. Charles had been notably non-committal on religious matters, and permitted considerable tolerance to his people as to the variety of Christianity they wished to follow. 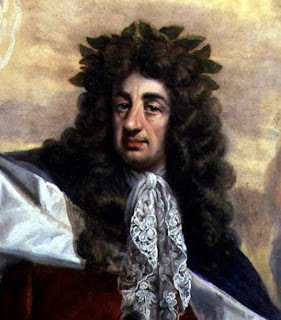 However, his brother James, who succeeded Charles as King James II, was anything but tolerant and, although only a convert to Catholicism, was utterly convinced that England must return to the Catholic fold. As Charles lay dying, James smuggled a Catholic priest into the royal bedchamber so that Charles would receive the last rites and die as a Catholic. It is unlikely that Charles had much idea of what was going on. On the morning of Friday 6th February Charles woke and asked to have the curtains opened. However, these were among the last words he spoke because he soon lost the power of speech then slipped into a coma. He died at around noon. It has never been established with certainty what it was that killed King Charles II. As noted above, some of the symptoms suggest a stroke, although kidney failure is also a strong contender. There have been conspiracy theories suggesting that he was poisoned, but those four days of weird and wonderful quasi-medical treatments cannot have helped. Incidentally, 6th February was also the day in 1952 when King George VI died of lung cancer and the current monarch Queen Elizabeth II, who was on a visit to Kenya at the time, came to the throne.